Catch the eyes of family and friends with this modern and unique planter set. Plant your favorite succulents or other small potted plants in the modern elegance of these ceramic bowls, or use these decorative pots to show off a variety of other decorative items. Add a dash of modern style and an eye-catching decorative touch to your home with this set of ceiling-mounted planters. Ideal for live potted plants, but can also be used to hold other decorative items from around your home, including seashells and potpourri. Additionally, you can use it as a candle holder. Natural Bamboo Trays High Quality Ceramic : The pots baked in high temperatures feature superior hardness, strength and wear resistance. With a small hole on the bottom for drainage and packed with bamboo tray for the water and soil not flowing out. 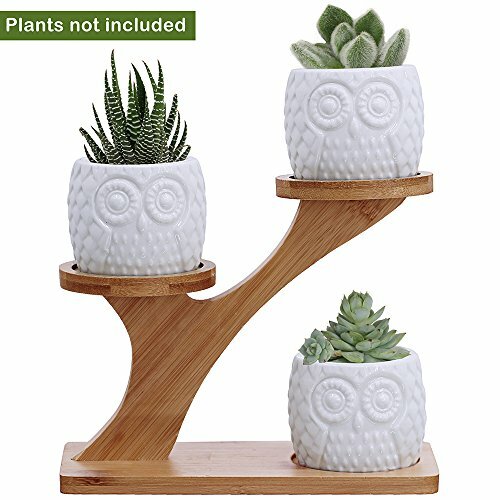 Attractive owl pots with 3 tiger bamboo stand are suitable for decorative gardening / desk / bookshelf / dinning table / living room / hosting room / cabinet / counter and everywhere. Adorable animal planter is good gifts choice for kids,parents,friends,schoolmates or colleague for any festival.